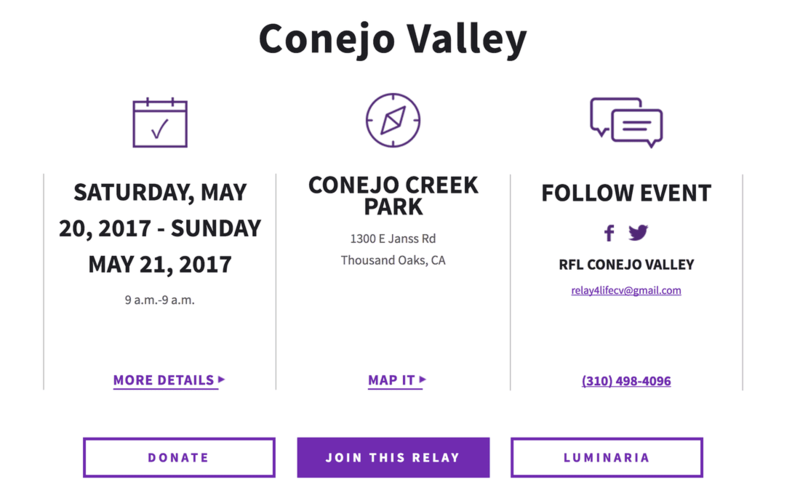 This year, CCO is proud to announce that two of its board members will be assisting in the management and community relations for Conejo Valley's Relay for Life to get our community out for a great cause! Cancer affects everyone — let's make a difference and honor those who have battled bravely and for those still battling. ​With our community relations director, Kinsie Flame, confirmed to chair the event, and our vice president, Jessica Weihe, hopping on to aid in marketing and community relations, we didn't hesitate in saying YES to a CCO team for Conejo Valley's 2017 Relay For Life! 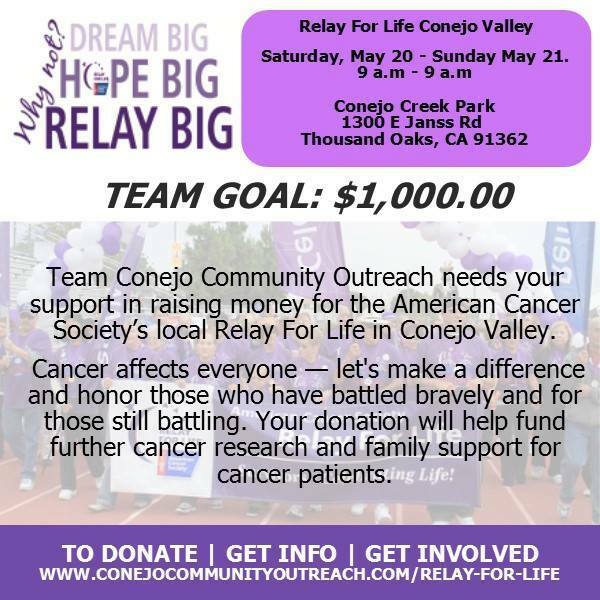 Please stay tuned for details and how you can help CCO reach our Relay For Life fundraising goal! Saturday, May 20 - Sunday May 21. Relay For Life is the signature fundraiser for the American Cancer Society. Relay is staffed and coordinated by volunteers in more than 5,200 communities and 20 countries. Volunteers give of their time and effort because they believe it's time to take action against cancer. 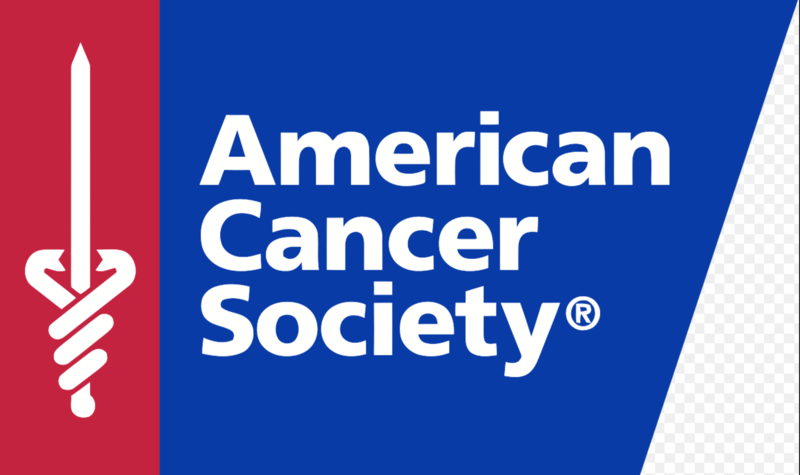 Join us at these events to bring communities together to remember loved ones lost, honor survivors of all cancers, and raise money to help the American Cancer Society make a global impact on cancer. REGISTER YOUR OWN TEAM --------CLICK HERE TO SIGN UP YOUR OWN TEAM! Are you interested in getting together your own team to participate in this year's Relay For Life? Learn more about how you can do so by clicking the link above or sending an email to info@conejocommunityoutreach.com. Please put in the subject line: ATTN: JESSICA/RFL inquiry. There are no limits to how many people you can have on a team! Get your family together! Have you coworkers form a team! Bring together a sports team or school team! The more the merrier. It is FREE to register a team!